Hope your month is off to a great start. I am back from a long vacation in August and returning to the creating I love and back to blogging when possible, even if in limited posts. This month I am happy to share I am the hostess at our Etsy Cottage Style ning group giveaway. We are a community of artists, sellers and buyers who share the love of Cottage style. If you love cottage style, please join us HERE! and become a member. Membership is fun and a great way to meet many talented and creative shop owners as well as like minded friends who just love cottage styling. You do not have to be a shop owner to participate. We would love to have you and after you join in~~ throw your hat in the ring for the giveaway too. Here are the pretties I will send the winner. One Santa Graphic and Rose wood sled measuring 17 inches long and perfect for a door display, add to a wreath or lean in a special spot throughout the winter. 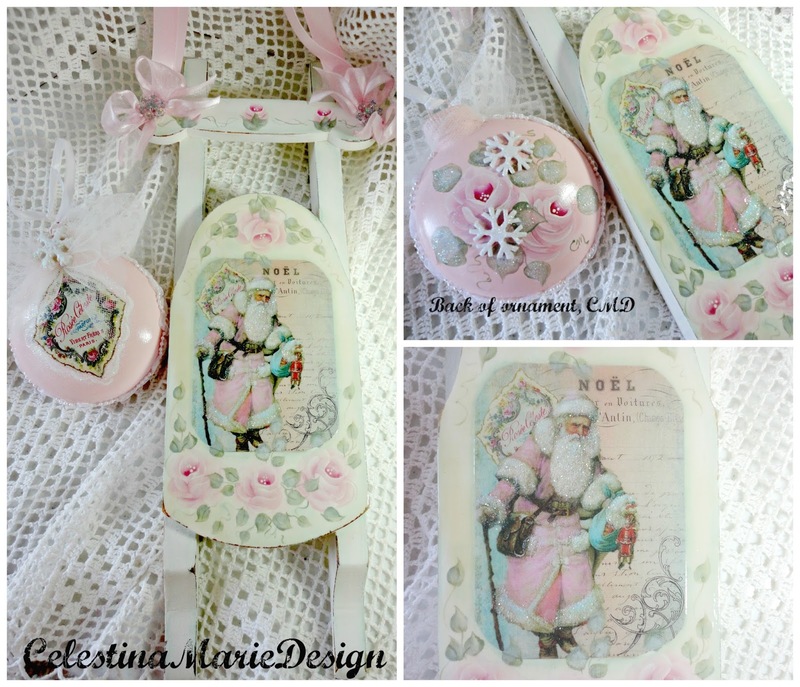 Included with the sled is one of my 4" puffed glass ornaments coordinating with the sled to match Santa's back pack with snowflakes and roses. The Graphic is gorgeous and created by Debbi from Marionberry Cottage. I created with her design adding fluffy cottage roses on a shabby and so chic distressed white wood sled. The glass ornament coordinates with the graphic and features a vintage label on one side and more cottage roses and snowflakes on the opposite side. Good Luck in the giveaway Etsy Cottage Style Friends. Remember, you sign up for the giveaway after you join at ECS ning group. In the meantime, I hope to see you all soon. I hope to share my journey in upcoming posts. We enjoyed a special trip and I will share pics soon. Wishing you a beautiful September Day! So good to see you back. I hope you had a much needed refreshing rest! I missed you! I would LOVE to be entered in this giveaway to have a chance to win some of your gorgeous goodies!! Like You I am no longer pressing myself to blog...if I do, I do and it seems to have helped take the pressure off. Blogging has changed so much since we all first started so many (few) years back! Like I said great to see you! I tried twice to sign up for Etsy but couldn't. What am I doing wrong. How nice to see a post from you here. I am so glad you had a good time away and enjoyed your Ruby Anniversary while you were gone. Best wishes to everyone that enters the giveaway. Can't wait to hear more from you when you have time. So glad to see a post from you Celeste! I do enjoy when you stop by to visit my blog and leave a comment. : ) Hope all is well and I can't wait to see what you've been creating. These giveaway items are gorgeous. 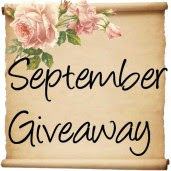 I am a member over at Etsy Cottage Style and will head over there to enter! Oh what gorgeous goodies for the giveaway! So glad to see you had posted! Can't wait to see the anniversary pictures...Of course maybe we don't need to see them ALL...LOL! Gorgeous designs! I'm so glad to hear from you. I'm popping into your Etsy shop to view the new designs. I get so much inspiration from your designs. Blessings and joy! Welcome back and so glad to hear that you had a wonderful time celebrating your ruby wedding anniversary. Look forward to seeing photos of your time away. Hope all is well with you and you are enjoying the week. It's so good to see you again here, Celestina! I am in love with your creations, the santa is so pretty. And you know how much I adore your gorgeous painted roses, too! Love the pastel colors, who says that Christmas has to be all about red and green? :) Also happy to hear that you had a wonderful anniversary and have gotten a chance to play more in your studio!! big hugs to you, sweet friend!! I love your blog & all the gorgeous designs! Congrats on your anniversary! I sure hope to win! I did not forget your 40th, but we were hit with the stomach flu which ran through our entire family from Aug.9 through the 27. Our little ones and my daughter were sick on vacation with us which made it so hard. I hope your trip was fabulous! I am so glad you came back to blogging! My best to you and Larry and for 40 more wonderful years together!! God bless you! I am almost ready to start my china cabinet, btw....LOL! So good to see you back again. Your giveaway is so beautiful- that sledge fantastic, and the bubble amazing in the pink and your gorgeous painted flowers and the snowflakes. I wish you a lovely september and look forward to se more from your time off the blog. Nice to see a post from you Celestina, and I want to say, I saw your add in the back of Victoria magazine. A sweet giveaway you're offering, I will check out the cottage membership. So glad that you are back with us! It sounds like you had a nice time off, and I look forward to seeing your anniversary pictures. It was good to see your lovely face on my comments today. I will put you back on my side bar right away. So happy to hear that you had a great time away celebrating your very special wedding anniversary. Many thanks for visiting me and the kind note you left. Please enter me in the giveaway. Thanks so much. Happy to hear you again, welcome back! anyway, I have sign up for twice at ECS, until now I have no idea whether they accept me or not. because after full filled the form, they mentioned I have to wait the confirmation,fact I have no receive any message. Do you have any idea with this about?. I would love to join if possible. so I can put the badge directly on my blog. So glad you're back with us and that you had a good hiatus! You and Larry sure deserve to have a wonderful time together just enjoying life and one another. I'm excited about the Giveaway at ECS! The prizes you're giving are sooo sweet!! I'm excited to hear about your trip in future posts. Welcome back dear friend! Welcome back, my friend. Would you believe that right before you stopped by and commented I was thinking of you? Cross my heart. :) I thought, "How I miss Celeste...is it autumn yet?" And here you are. YAY! I'm happy to hear your Ruby Anniversary time away went well. Where does the time go, right? I think that almost every anniversary. Great giveaway, beautiful prizes...best wishes to all and thank you. I am so glad you are back! You were missed by many here in blogland. I often checked your blog to see if you had come back. I hope you had a nice vacation. I see you are back to creating... me too! Between my Shih Tzu art & French decor its going to be busy! Happy anniversary. Such pretties you are giving away. Love the creativity I see here and am following along! Hi Celeste, just stopped by quickly to subscribe to your blog via email. I'm doing so with a handful of dear blogging friends I am continuing to stay in touch with. Always a pleasure to visit with you. Loving all your pretties! And so happy to see your post. I've been away from blogging and facebook and everything...trying to get things done around here - all with 3 little Pups that have been having some tummy problems...and we still don't know what they got into. Read my post today. Just checking in to see how you're doing! We've been busy here and staying out of trouble LOL! Hope you and Larry are doing well! I entered your giveaway and your art work is Just FaBuLoUs! Thanks for sharing your work, I hope I win! So great.. really great.. to see you back after you hiatus! Miss seeing you! Looking forward to more creative endeavors and adventures from you..